Olinda Mechanics' Institute. Established on this site 1913. The Mechanics' Institute movement began in British urban industrial centres in the early 1800s. A "mechanic" was a person applying skills and technology. During the 19th century, most towns in Victoria established a Mechanics' Institute or Athenaeum with a library and meeting hall. Common objects were the "spread of useful knowledge" and provision for "rational recreation" in the community. A site for a Mechanics' Institute was reserved in 1907, a committee was formed, and a grant provided. 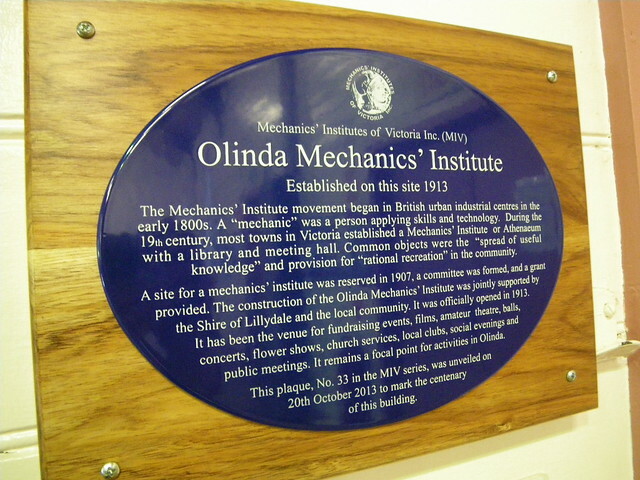 The construction of the Olinda Mechanics' Institute was jointly supported by the Shire of Lillydale and the local community. It was officially opened in 1913. It has been the venue for fundraising events, films, amateur theatre, balls, concerts, flower shows, church services, local clubs, social evenings and public meetings. It remains a focal point for activities in Olinda. This plaque, No. 33 in the MIV series, was unveiled on the 10th October 2013 to mark the centenary of this building.